The Brandon Saad watch is on in Columbus. 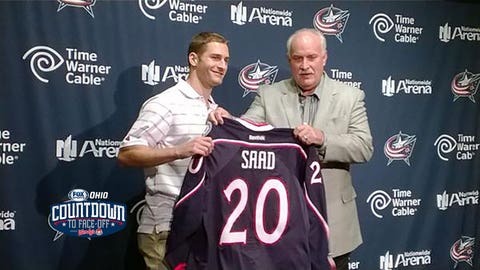 The Blue Jackets head into the season with all eyes on Saad, the talented 22-year-old forward acquired from the Stanley Cup champion Blackhawks in the offseason. There is hope that Saad and new arrival Gregory Campbell will help the Blue Jackets rebound from a 42-35-5 season that left them out of the playoffs. Coach Todd Richards can at least point to the end of last season, too. Columbus won 15 of its final 17 games, and after a tough overtime loss to the Rangers, he said "there’s confidence, belief in the room." Now they have Saad, who had career highs in goals (23), assists (29) and points (52) in Chicago last season. INJURY WARD: The biggest reason Columbus found itself on the outside looking in when the playoffs started was due to injuries. The Blue Jackets lost 508 man-games due to injuries. If you believe in mathematics and probabilities, it’s not likely that Columbus will be so shorthanded in 2015-16. BOB-ING FOR SAVES: Much is made of Columbus’ skill upfront, and with good reason. The Blue Jackets forwards should be able to hold their own with the NHL’s best. But that’s not the only area of strength. Columbus is solid in net with Sergei Bobrovsky. Last season, Columbus’ No. 1 goaltender compiled a 30-17-3 record in 51 games with a 2.68 goals-against average and .918 save percentage. BLUE JACKETS’ STING: What to get two-thirds of a top line that combined for 57 goals, 87 assists and 144 points last year? If you’re GM Jarmo Kekalainen, you trade for Brandon Saad and have him ride shotgun on a line with Ryan Johansen (26-45-71) and Nick Foligno (31-42-73). It would not be a surprise if the trio represented the Blue Jackets at the NHL All-Star weekend. BLUE JACKETS’ BITE: One of Columbus’ strengths is that their personnel can match an opponent’s desired style of play. Saad, Johansen, Foligno, Brandon Dubinsky and Scott Hartnell provide varying degrees of skill and goal scoring. Foligno, Dubinsky, Hartnell and David Clarkson also play a hard, heavy game that can physically tax opponents. ON THE DEFENSIVE: For as deep as Columbus’ forward units are, the area many point to as a question mark is the defense. The Blue Jackets do not possess a traditional No. 1 defenseman. What the Blue Jackets do have are two solid pieces in Jack Johnson and Fedor Tyutin, and two intriguing talents in Ryan Murray and David Savard. Can the whole be greater than the sum of the pieces?